Not as many rides as I would've liked to take. Sometimes the little nuances of life get in the way. ...I can get the thrill!!! Actually I enjoy the meditative quality of climbing the hills. Wisely choose the tunes to play on my mini sound system, set my brain on cruise control, adjust my mirrors and I'm good to climb. I've accumulated 980 miles so far this year and 85,000 feet of elevation gain. I could easily ride south on my rides and accumulate more miles with much less climbing but where's the thrill??!! This old fart still needs a thrill!!! Gotta live!!! Side Note: I must say it again the Catrike 700 / 20 is an awesome ride!! The only limits on this machine when taking a downhill run are road conditions otherwise it just wants GO!! Here is a short (pun intended) review of the Endura Hummvee Lite Short from a bent up perspective. I've been wanting to take a closer look at these shorts but laying down $80 plus bucks online without knowing what to expect put me off. I stopped in to say hey to Vincent at JRA Bikes & Brew (my post) and while he was on the phone I was wondering around his shop and came across the Hummvees. I bought a pair of the Hummvvee Lite Short. Both Hummvee regular and lite hanging on the rack ready for me to inspect. Here's what I have to say about Endura Hummvee Lite Shorts...they're exactly what I've been looking for with one minor adjustment required. As bent riders know regular shorts sometimes end up looking like booty shorts as the wind on fast downhills does it's magic. My first requirement on a pair of shorts is hem adjusters. These shorts have them but on my leg they don't take up enough slack so Carrie shorten the velcro strap and now they do the job. They keep the legs from righting up and do a nice job of keeping the wind from ballooning the shorts. The Hummvvee is advertised as baggie MTB shorts but they fit like normal shorts so any ballooning is minimal. Keep in mind they run big so a medium size fits me perfect. Otherwise everything else I own is large. They come with a padded liner that snaps onto the shorts. Who needs padding when you're bent? Thus my other concern that held me back from buying online, the snaps. Would the unused snap poke me in the side while riding? No problem, the receiving end of the snap that's on the shorts is flush and minds it's own business. The Hummvee Lite is made of lite rip stop nylon. The rear and inner thigh area is made with a sturdy nylon material. Overall I'm really happy with threads. They're a keeper. JRA Bikes & Brew in Agoura Hills is the newest bike shop in my town of Agoura Hills serving coffee, smoothies and more while getting your bike fixed and looking at bikey merchandise. I have it on good authority that they welcome all, including those who dwell on the dark side...recumbent riders. Looking at the repair shop and coffee area. Thar she be...with Byron riding in the morning gloom of June. I'm back on the road again with the 700. A little boring health issue which deserves no mention here kept me sidelined for a week. 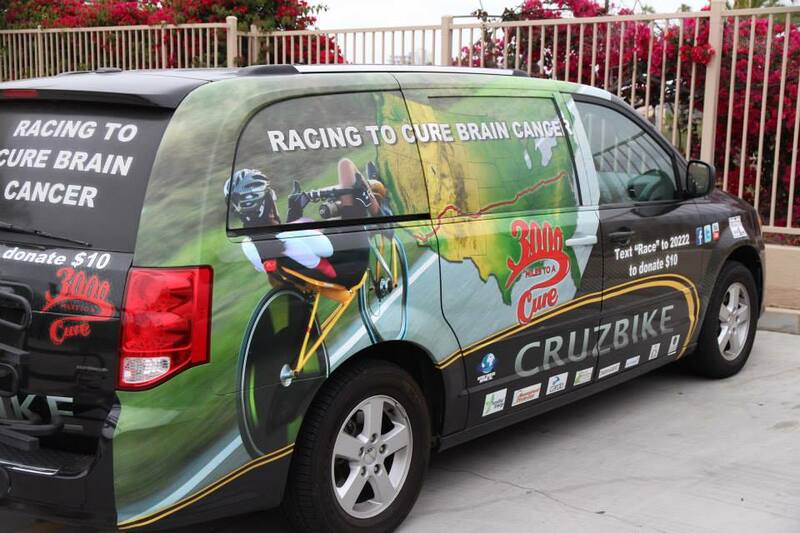 Then it took a couple of extra days more to clear my head after Maria Parker's accident with her support van during the RAAM. Cycling incidents always give me reason to pause and examine how safely am I cycling. Under what circumstances should I not compete with a ton of fast moving steel being driven by someone who's driving skill is unknown? When should I opt to take a different route, ride at a different time or change up my routine entirely? Every cyclist should ask themselves "what risk am I willing to take to enjoy a ride, competition or a tour?". Unless one has a death wish the goal with any activity is to minimize risk. The perception of risk lies with the individual, and the level of risk that individual is willing accept in any given activity is a personal choice. The first thing I do before I put foot to pedal is to make sure my head is screwed on right. Unlike when I take a hike daydreaming is not an option when cycling on the road. My head has to be in the game. If I'm not visually communicating with drivers then at the least I'm watching them. Any driver that I can't make eye contact with I assume they don't see me. As for safety equipment that is a topic onto it's own and the subject of much debate. I have confidence in the choices I've made regarding safety equipment. Let it suffice to say they I don't compromise with my choice of safety devices to save a few dollars. I feel I have done everything I reasonably can to be as save as possible when cycling on the road. I have good reason to be around for awhile and it's not all selfish. Ride safe and demand it of those you ride with. 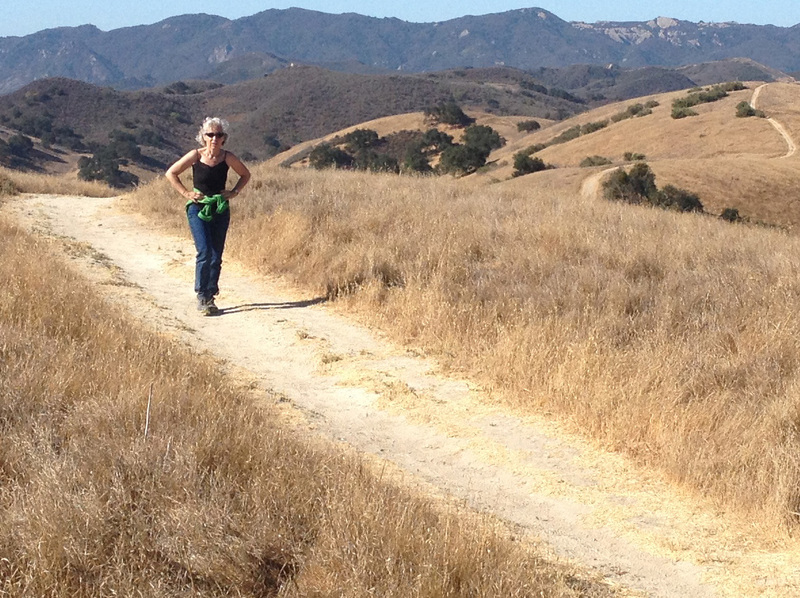 With the vision of Mari Parker's RAAM support van trashed I decided to go on hike today. I'll be back on the road again over the weekend. A well placed picnic table a mile into the Canyon. 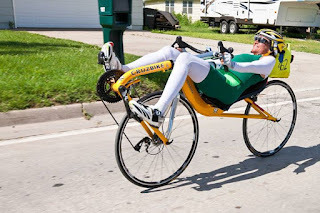 At the live RAAM press conference today Maria Parker had to put up with ignorant comments (lawn chair on wheels) from the moderator regarding recumbent bicycles. She handled it very well and nicely corrected him as needed. The video may still be available here. Maria Parker's portion of the interview starts at 15:15 minutes and again at 29:29 minutes. Race starts tomorrow - support Maria! - Maria's personal live tracking at 3000 Miles to the Cure - Where's Maria? From Maria Parker's 3000 Miles to a Cure Facebook page. 6/13 "Every one is fine, but the van and two bikes are totaled. Will update as we can. Outside tuba city"
6/14 "WE ARE GOING TO DO THIS! Maria wants to get back on the bike and finish what we've started. In the next couple of hours, the crew will meet and outline exactly what we need to make this happen! 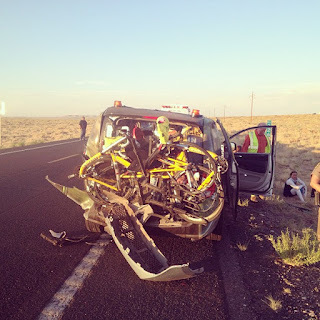 Due to damage to the vehicle and destruction of equipment, we can no longer officially participate in RAAM but we are still going to do what we set out to do. We are all so overwhelmed by the incredible outpouring of love and support from all of you. This is the power of WE. And WE have the power to end brain cancer." 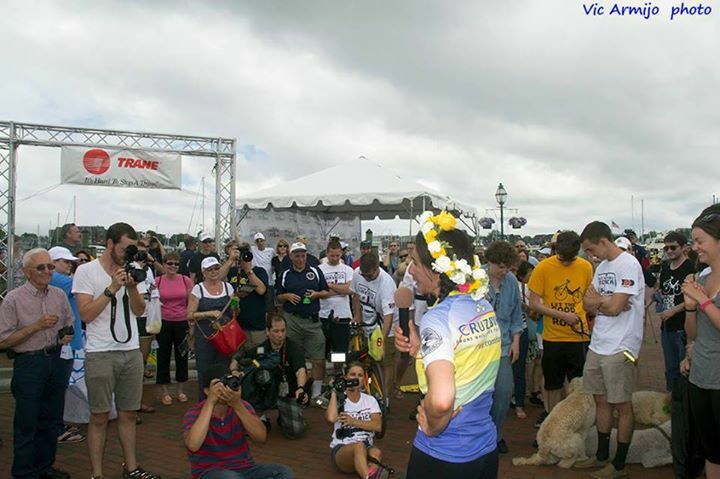 6/14 (later in the day) "Against all the odds, Maria and the 3k team have been allowed back into Race Across America as a full competitor! 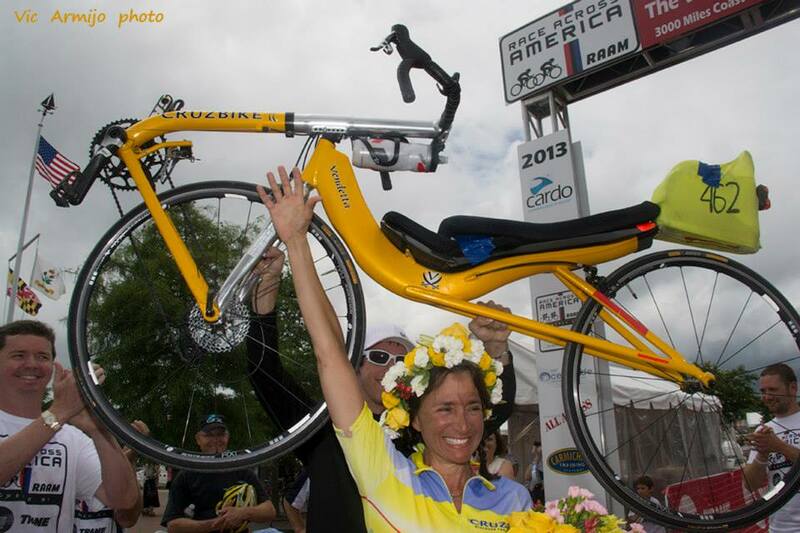 That's right, Maria can still finish RAAM!" Maria Parker rolls on in first - what a comeback! RAAM 2013 - Maria Parker's Amazing Comeback Victory from Jim Parkers blog at Cruzbike.com. 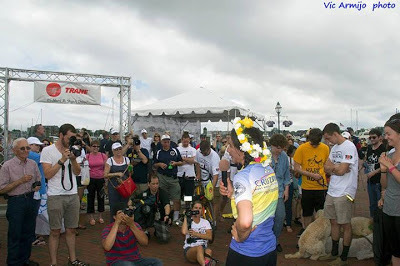 Part 1 of Maria Parkers RAAM story. RAAM 2013 - The Rockies and the Plains from Jim Parkers blog at Cruzbike.com. Part 2 of Maria Parkers RAAM story. I emailed the organizers of the November 1st Solvang Prelude a question about trikes. I've heard of some cycling events claiming they are not prepared to provide SAG support for us three wheeled crazies. The Solvang Prelude folks are fine with three wheels, however I must share the response to my question about trikes. You okay with recumbent trikes riding the Prelude. No problem as long as your vehicle does not sway side-to-side. If pedals like any bike............fine. Does that mean no pre-ride beer? Thank's for getting back to me, see ya. You...........I'm not so sure about! Schwalbe Presta Valves have removal cores, make sure these suckers are tight. Three times in as many years I've found a wheel sitting on it's rim with a flat tire. Last weekend when it happened I went through the bother of replacing the tube so I could ride without worry. When I returned from the ride I tested the tube in a bowl of water and watched one little bubble at a time slowly trickle out of the stem. I tighten the core and put the tube back in my vast inventory of tubes.